There are a lot of concerts I never saw that I wish I could have or regret missing. I was ill when Nirvana, Pearl Jam, and Soundgarden played our town back before they hit it big. I never got to see Stevie Ray Vaughn play. And I missed The Highwaymen. This was a supergroup, of sorts, made up of country "outlaws" who are also some of the best songwriters in the last 50 years. Johnny Cash, Waylon Jennings, Kris Kristofferson, and Willie Nelson together on one stage, singing their best work and incredible original songs. Of them all, only Waylon had a great voice left (and neither Kristofferson or Nelson ever really had a great voice) but they still were amazing. All I have is the CD, and since both Cash and Jennings have died since then, it will never happen again. There will never be another Johnny Cash or Waylon Jennings, but new guys have come along like Dwight Yoakam and let's be honest, there was an awful lot of crap country back in the old day, too. Waylon Jennings is one of those guys everyone has heard and knows, even if they don't like country and haven't heard of him. He did the theme song to Dukes of Hazzard which, separated from the show, is a pretty good song. He sang a long, impressive list of hits, many of which were those storyteller songs which leave me wishing I could have come up with the tale like Rose in Paradise. One of his greatest hits is a song sort of about himself, his wild life, and his wife. 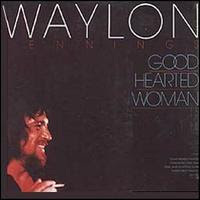 The song is "Good Hearted Woman," and it tells the tale of a marriage between a good woman who loves her man no matter what and a guy who isn't really worthy of her love. Its a song about a marriage founded on dreams and promises and ideals that never really happened because the guy just couldn't be trusted and is always out drinking and having a wild time with other women, but he always comes home and his wife always loves him anyway. Its sad and hard to hear in a way, but at the same time you are amazed and respect the woman for her constancy and steadfast love, no matter what, of her good timin' man. And the music doesn't just carry it along, it sweeps you along, building as you enjoy the good times with the rascal of a man despite the basic sadness of the lyrics. Its almost like the man who starts out with regret and sadness just can't help himself in the end. A good hearted woman, lovin' a good timin' man. Worth a mention: Willie Nelson co-wrote this song with Waylon, one of the first of many they would pen together. Even before the Highwaymen, those two were quite a duo. Also, I must take issue with your statement that Willie Nelson never had a great voice. I don't think Nelosn belongs in the same category as people like Kristofferson/John Prine/Steve Earle, singers who really do have horrible singing voices but make up for it with great songwriting and "character". Nelson's vocal style may not be pleasing to some ears, but it is a much more refined style than those others (all whom I love and listen to almost daily). Unlike those other signers, Nelson actually does have quite a range to his voice and is a very technical singer. The thing that throws people is that he is singing country music while employing vocal (and guitar) techniques more common to jazz singers like Louis Armstrong and Billie Holiday. A lot of that has to do with odd phrasing and tempo, but it also requires more masterful vocal skills than most country singers have, especially of Nelson's generation. He just does all of it with a dry Texas twang. In fact, Nelson's style is so unique that, unlike most country singers, it is very tough for amateur musicians to duplicate his sound. For a long time I have been interested in learning to play guitar like Willie Neilson (not just learning to duplicate his guitar licks, but understanding the jazz techniques and scales that he employes) and it is *very* difficult to find instructors who can teach that style... most will just try to shoe-horn jazz licks on a classical-style guitar on top of simple country or rock chord progressions and rythms, but the end result doesn't sound a lot like what Nelson plays. I know a ton of blues players who can do decent Stevie Ray Vaughn impressions, but very few guitar players who can sound like Willie Nelson. I suspect that when he dies, we'll see a lot more interest in the musical style he spent half a century refining. It could be I just don't like his voice, and I cannot stand the way he messes with rhythm and timing live, it basically ruins songs I like but that could be just personal preference. Still I like Willie Nelson a lot, and he's an amazing songwriter. I absolutely concede he has an odd style that not everyone will like. I just think there's a difference between what they don't like about him and what they may not like about Kristofferson, Prine, etc... i.e., objective lack of vocal ability vs. more subjective and personal ideas about taste and style.